Many large-scale accelerators deliver short, powerful pulses of proton beams. Creating the beams involves accumulating multiple lower power beam pulses to produce a single high-power beam pulse. Today, the achievable proton beam powers are limited by the technology used to merge the incoming pulses into a final beam pulse. To resolve this limitation, scientists demonstrated a new technique, called laser stripping. The approach uses a high-power laser and two magnets. 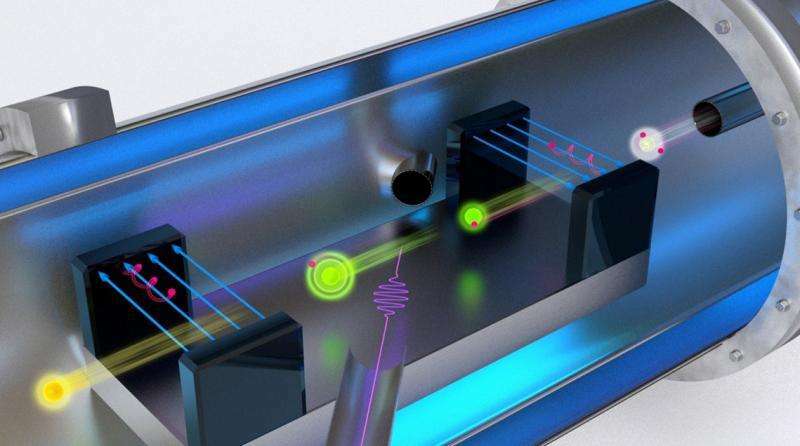 The new approach could revolutionize how high-power proton beams are generated in accelerators. Scientists use the beams to answer tough questions about materials. Industry uses the beams in medical and security applications. Laser stripping means next-generation accelerators with significantly higher beam powers. Higher beam powers result in increased rates of particle production and higher particle collision rates. The conventional method of merging beam pulses starts with an incoming pulse of energized hydrogen ions, H-, or a proton with two electrons, merges the ions with a circulating proton beam in a ring, then strips the H- ions of their electrons to leave only protons in the beam. The electron stripping is performed by passing the just-merged, dual-species beam through a micrometer-thin film made of a low atomic number, high melting point material, called a stripper foil. These stripper foils degrade at high temperatures. The degradation limits the achievable proton-beam power density. The laser stripping technique is a novel method of removing the electrons from an energized H- beam without any material interaction. As a result, it is scalable to arbitrarily high beam powers. In the laser stripping method, a magnet removes the weakly bound outer electron from the H- ion, turning it into a neutral hydrogen atom. The tightly bound inner electron is then excited by a laser to a loosely bound state where it can be stripped by a second dipole magnet to produce a proton. In the experiment recently conducted at the Spallation Neutron Source accelerator, scientists demonstrated the laser stripping technique for a 10-microsecond pulse of a 1 gigaelectronvolt energy H- beam using commercial laser technology. The achieved electron stripping efficiency was greater than 95 percent, comparable to typical efficiencies in the conventional foil-based method. This was the first demonstration of the technique for realistic time-scale beams in an accelerator. The technique was a factor of 1000 increase in pulse duration compared to a previous demonstration where less realistic scales were used.